Something similar to this would definitely be mine. 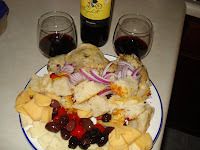 One of Mr. Sweet and my favorite dinners is a cheese, meat, vegetable and bread plate with a bottle of red wine. Sometimes I will add calmata olives and some sweet peppers. So delicious and simple. I've just discovered Havarti cheese. It is creamy, yet has a bit of sharpness to it. The other day I went to the local junior college culinary school's bake sale and found a fabulous loaf of foccacia. Tender with a crusty edge, moist on the inside. You should definitely give this elegant meal a try! All I can say is "YUMMY!"